According to Foodable Founder and “Across the Bar” host Paul Barron, Brimmer & Heeltap in Seattle is one of the most unique restaurant spaces we’ve seen. “It’s like a new little world every time you turn a corner,” says Tyler Stamon, the concept’s bar manager and expert mixologist. “This is so fun. I mean, you’re serving people, you’re providing an experience, and you’re telling a story to people,” he says. And that’s exactly how Stamon approaches his cocktail creations when putting together a drink menu. “I’m trying to tell a complete story. I don’t want somebody to come in that likes vodka and there’s only vodka drinks on there or only whiskey,” he says. He also takes into consideration the seasonality and what the kitchen is doing, so the food and drink compliment each other. 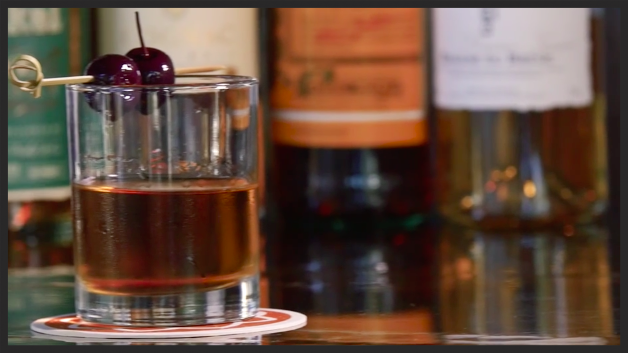 In this episode of “Across the Bar,” Stamon takes us through the journey of three top cocktails and tells us of how they were inspired and developed. Described as “a riff on an Amaretto Sour” with a twist, this cocktail sneaks up on you. “I added some cardamon bitters, which cuts down the amaretto a little bit, so you still get that sweetness but then the cardamon kind of plays and gives it more of a spiciness,” says Stamon. “And I just really like it with the naval rum — Jamaican Smith & Cross.” Stamon describes the flavors as “grassy, funky” that stand up to the amaretto, which pulls it all together. Melleti amaro gives it a piney taste, and a Giffard banana liqueur is what sets it all off, says Stamon. He decided to serve this cocktail without an ice ball, as you would normally find in such a concoction, because serving it without opens up the flavor possibilities with each sip. With a nice aroma and a clean taste, the New Jack Swing is made up of apple jack, Cocchi Torino, and sherry (which gives it “a dry, nutty flavor,” says Stamon). In his constant interactions with guests, Stamon has picked up a few things from the modern-day guest. With every interaction and order, Stamon continues to tell a new story through each drink.